A paddock of Riverine and Swamp buffalo cows had been calving normally for the previous three months with no calf or cow losses. Over a period of two days, the manager of the property noted four of the youngest calves, aged approximately one to two weeks, were spending an increasing amount of time lying down away from the herd. The dams of the affected calves were experienced mothers and there had been no known disruption to colostrum transfer. The four calves were alert, feeding and not dehydrated. However, they were very reluctant to stand and, when forced to move, they walked slowly with hunched back and hyperextended legs to varying degrees. Clinical examination revealed hot painful joints of the limbs of all affected calves. White blood cells were mildly elevated in two of the calves indicative of infection. The serum proteins (albumin and globulin) were low to normal. Malnutrition and congenital immune deficiency can cause a decrease in total globulins. Gamma glutamyl transferase (GGT) levels were normal range. GGT levels would be expected to be much higher (up to 60 times) in calves younger than 30 days old due to the high level of GGT in colostrum, which suggested the calves may have been somewhat colostrum-deprived. Joint fluid collected aseptically from three of the calves was cloudy, with abundant white blood cells. Escherichia coli (E.coli) was cultured from joint fluid and/or blood samples of all calves. 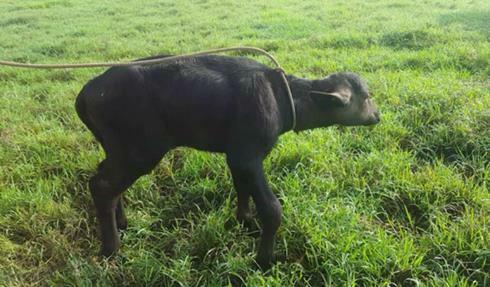 Despite two courses of antibiotic therapy, initially with long-acting tetracycline and subsequently with daily trimethoprim-sulpha, the calves failed to improve and were euthanized. Necropsy of all calves confirmed severe chronic polyarthritis. There were also abscesses around the ear tags of two calves. The manager was advised to use a disinfectant when tagging calves. There were no further losses reported. It is possible that the particularly hot weather resulted in calves spending increased time in water wallows. These wallows may have had a build-up of environmental contamination due to the drier-than-usual weather. Joint ill is occasionally seen in orphaned calves, particularly when a number of calves are housed in one yard. Limited colostrum from the dam compromises the immune system of the calf and predisposes the calf to infection. Iodine should be sprayed on the umbilicus of orphaned calves and prior to ear tagging and sick calves isolated from other healthy calves.